Listen to "Death in the Afternoon" on your iOS and Android device. Death in the Afternoon is an impassioned look at bullfighting by one of its true aficionados. It reflects Hemingway's conviction that bullfighting was more than mere sport and reveals a rich source of inspiration for his art. The unrivaled drama of bullfighting, with its rigorous combination of athleticism and artistry, and its requisite display of grace under pressure, ignited Hemingway's imagination. Seen through his eyes, bullfighting becomes a richly choreographed ballet, with performers who range from awkward amateurs to masters of great elegance and cunning. 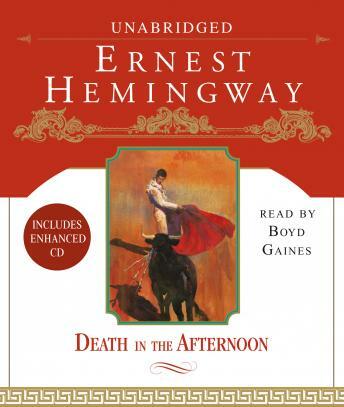 Death in the Afternoon is also a deeper contemplation of the nature of cowardice and bravery, sport and tragedy, and is enlivened throughout by Hemingway's sharp commentary on life and literature. A magnificent work that gives a different view of Hemingway's passion and observation when it is not constrained by the confines of constructing a story. This work was well narrated to show that as well.